How To Get the Best Inbound Links! By providing you with contextual, inbound links, Ultimate Guest Blogger provides the best inbound links to your web content and online presence. By now, most of you know that the popularity of your website is determined by how many inbound links that you have and the quality of those links. In fact, in the past, you could just pile on the inbound links to your website and generate a lot of traffic. However, in recent years (and especially over the past year), Google has updated their search algorithms so that quality trumps quantity. What Is a Quality Inbound Link? Since a large quantity of inbound links used to generate a lot of goodwill for your website, people would often write articles and then submit them to article directories. As we mentioned in our post, Article Marketing: What Happened and What To Do?, age old techniques such as article marketing, bookmarking, or blog commenting do not work like they did in the past. In fact, these types of inbound links may penalize your site. Read more about the SEO Over-Optimization Penalty here. The reasons for these penalties are essentially this. The idea behind inbound links is that one legitimate website vouches for another. However, with these types of links that were penalized, all of the inbound links were essentially self-generated. Nobody was vouching for the content. Additionally, the inbound links were not contextual. That is, within the body of an article. The reason that guest blogging has skyrocketed in popularity is because it is consistent with the original goal of the search engine algorithm. One legitimate website vouching for another. However, traditional guest blogging is cumbersome and riddled with problems. To simply publish one article on someone else’s website can literally take weeks or months. At Ultimate Guest Blogger, we have solved this problem. The ultimate goal with guest blogging is to write superior content for other websites with an inbound, contextual link back to your website. As we mentioned, this is the best type of inbound link. Unlike a resource box link or a comment link, links used within an article are valued as the most important. This is the type of quality link that Google and other search engines love! This is why guest blogging works so well. However, as mentioned above, traditional guest blogging presents so many obstacles that it does not provide a quality return on your time investment. Until now. The reason that traditional guest blogging takes so long is a matter of trust. Since other websites are going to accept your content, they need time to read it, request edits, check the links, and communicate back to you. Ultimate Guest Blogger solves this problem by assuming trust. If you write a few quality articles, shouldn’t you be rewarded by not having to prove yourself time and again? At some point, your content deserves to be trusted. Think of this trust factor like a passport…you apply and receive your passport once and then you are trusted. Imagine if you had to re-apply for a passport every time that you wanted to travel! Since Ultimate Guest Bloggers focus on quality content, they can be trusted and many of our blog owners will automatically publish their content, without the need for endless correspondence, edits, rewrites, and communication delays. Thus, instead of the weak, and perhaps penalizing, inbound link that you achieve elsewhere, you receive inbound, contextual links back to your online content without delay. 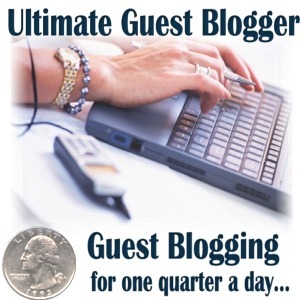 And that, my friends, is why Ultimate Guest Blogger is the best guest blogging solution on the market today!